Becca has come under severe attacks on social media for preaching virtue and practicing vice literally. Born Rebecca Acheampong aka Becca has been chastised by fans for her overnight extremely fairer complexion. The reason being that Becca has been an advocate for ‘African Woman’, therefore, the question frequently asked by fans is where from the skin toning? But Becca in trying to answer the bleaching saga via her Instagram page seems to be punching her critics with subtle jabs. In her recent post, she has reminded her critics to brace themselves for her because she is coming with a difference this year. She posted on Instagram: “I can smell the world with this my African nose 👃 Brace yourselves! The year just started for me!! 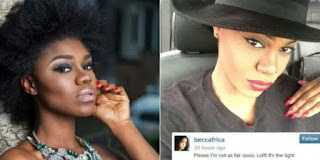 Assessing Becca’s post on Instagram, one could reason that the songstress is fully aware of the overnight transformation of her complexion any time she comes close to the mirror just that she is not ready to listen to the fans.